Capacity has been increased today – but one northside councillor says “the jury’s still out”. 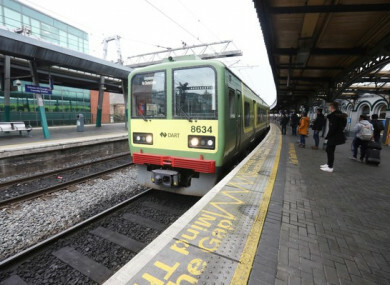 IRISH RAIL HAS increased capacity on some of its services today, following complaints over capacity on its new timetable. The new nationwide DART and train schedule came into force at the start of this week, leading to what the company has called “teething problems”. Passengers in Clongriffin on the northside of Dublin are calling for a full restoration of capacity. Local Solidarity councillor Michael O’Brien said today that the “jury is still out on the new schedule”. Commuters in the area have started a #RestoreOurRail social media campaign with passengers documenting their experiences of overcrowding and shorter trains on Twitter over the last few days. @IrishRail I’ve emailed the customer service to make a complaint about this morning. I was very concerned about my child’s safety on the overcrowded Dart. He was being squashed as more people got on and found it difficult to breathe. There was no air in the carriage either. We increased capacity on a number of DARTs starting from Malahide this morning and this has helped to alleviate crowding issues. Cregan said “one service is gone from 4 to 6 cars and another is gone from 6 to 8″. It remains to be seen whether it’s a gesture, as a opposed to a full restoration of capacity. Irish Rail said the timetable is being kept under review in order to address the issues. A meeting with passenger representatives is expected to take place in the coming days. Email “More carriages added to DART trains after new timetable leads to raft of complaints ”. Feedback on “More carriages added to DART trains after new timetable leads to raft of complaints ”.